We are located in Ballycahan, Doolin, a 3 mins. drive from McDermotts pub; the house is signposted. For driving directions please have a look on the map below. Enjoy the majestic views of the Cliffs of Moher and Aran Islands while you indulge in our freshly prepared extensive breakfast, or while picknicking on the table in front of our house! On the doorstep of nature's beauty, Limestone Lodge is also the perfect location to take an evening stroll and enjoy the panoramic views of a Burren sunset. Doolin, or 'Fisher Street' is a great fishing village. It has always been associated with great Irish music sessions, and was home to a great traditional Irish whistle player, the late Micko Russell. A visit to the Aran Islands is an unforgetable trip and one that you cannot afford to miss. Boats leave several times daily from Doolin Pier. The famous Cliffs of Moher are over 200 meters high, and give visitors a high vantage point over Galway Bay and the Aran Islands. O'Brien's Tower stands guard at one end and Moher Castle is situated at the southern end. The cliffs are home to numerous seabirds,including gannets, razorbills guillemots and puffins, and the area is a birdwatcher's paradise. A popular, exciting walking trail extends all along the Cliffs between Doolin and Liscannor. The Burren are about 500 sq.kms of lunar-like limestone landscape and surely one of the highlights in the Irish landscape. Its apparent bareness nurtures a surprising famous flora with many flowers which can not be found anywhere else in Ireland. When Stone Age farmers settled in the Burren they found the area forested. By late medieval times the felling of timber and the grazing of cattle produced to-days skeletal landscape. Man has left a mass of evidence of having lived on the Burren for thousands of years. Material remains abound, including megalithic tombs, stone and earth ring forts, round towers, medieval churches, monasteries and castles. Burials took place in Poulnabrone and other dolmens over a period of 600 years from 5200 to 5800 years ago. Gaelic Chieftains like the O'Briens, the O'Connors and the O'Loughlins - who were the Princesses of the Burren - had their castles here. One at least, Gleninagh Castle was inhabited until the middle of the 19th century. There are numerous caves, two of which, Doolin & Ailwee Cave are open to visitors. 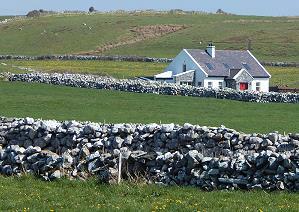 The Aran Islands are an extension of the Burren landscape. 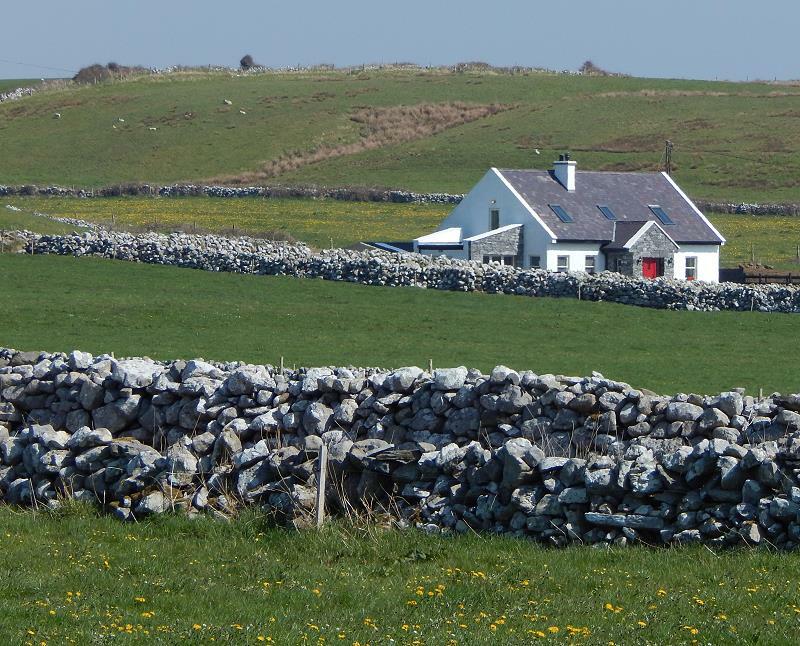 The islanders, which still speak Irish, traditionally made their living from fishing. While the men were out fishing the women knitted the traditional 'Aran Ganseys'. 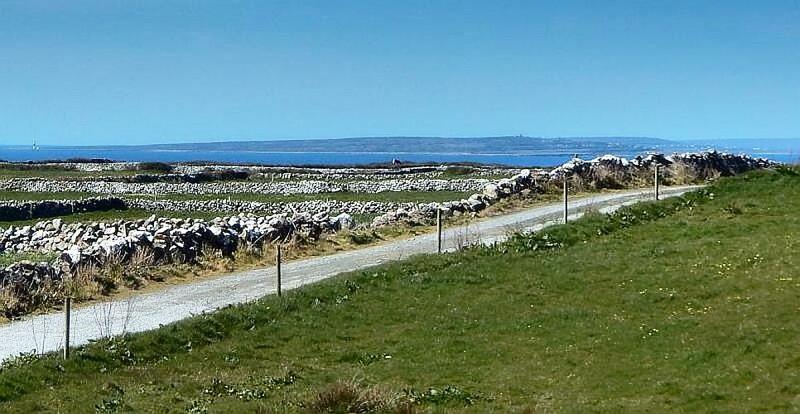 Each of the Islands, Inis Oírr, Inis Meain and the largest Inis Mór has its own individual character and is a favourite for walking and biking. You’ll find ancient forts, churches and monuments on all 3 Islands. The picture below shows the view you have from our house towards the Aran Islands.